Nissa, Voice of Zendikar was just one of the surprising innovations to appear in the MOCS Top Decks. What’s so great — and what’s so different — about wrapter’s take? First of all, wrapter went heavier on the tokens theme than most Atarka Red decks, main deck. In addition to Dragon Fodder and Hordeling Outburst (which aren’t always played as four-ofs, each), wrapter ran Pia and Kiran Nalaar in his MOCS main deck. 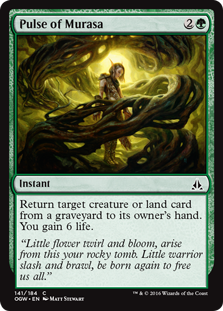 Keying off the likelihood of having a ton of small token creatures in play… wrapter played Outnumber as a main deck removal spell! This might be the first appearance of Outnumber in a serious Constructed deck, let alone in an offense-oriented red beatdown deck. What makes this deck really interesting, though, is wrapter’s sideboard. Check out those four copies of Nissa, Voice of Zendikar! In order to hit the GG in Nissa’s top-right corner, wrapter bolstered his mana base with an additional Cinder Glade and not one, not two, but three additional copies of Windswept Heath out of the sideboard! 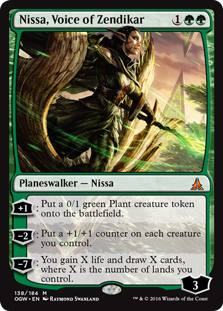 Presumably those eight cards all come in together (Nissa actually needs a little help hitting GG). Even if wrapter sides out some basic Mountains, with 4 Bloodstained Mire (which can get Cinder Glade), 3 Cinder Glade, 1 Forest, 4 Windswept Heath, and 4 Wooded Foothills he has a fat sixteen sources of green, making GG reliable and possibly even on-curve in a largely mono-red deck. Nissa, Voice of Zendikar can make tokens of her own, build to a Control-esque advantage, or go Crusade style for all of wrapter’s other token creatures. This is a truly inventive and exciting innovation in terms of Red Decks. Patrick loves not only Jeskai Black, but this style of Jeskai Black! 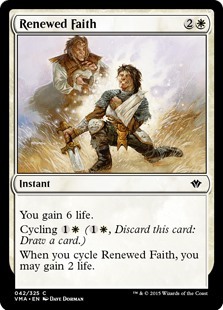 He is currently enamored of decks that play Kalitas, Traitor of Ghet; the graveyard-hosing on Kalitas is appropriate for a world full of Rally the Ancestors, but the lifelink is also relevant for a deck that is planning to get ahead with Painful Truths. Speaking of Painful Truths, all that card drawing makes a ton of sense with so many quick interaction cards like Duress, Fiery Impulse, and so on… And all of those cards of course work beautifully with Monastery Mentor. Anyone who has been listening to the podcast for the past several months knows how Patrick feels about Jace, Vryn’s Prodigy; Monastery Mentor; Kalitas, Traitor of Ghet; Painful Truths; and of course Dig Through Time. … And this deck even makes room for a copy of Chandra, Flamecaller. It hits a lot of bases for Patrick; so beena’s MOCS build might be one you might want to take a closer look at. What is the “core” of the Modern Eldrazi deck? Is it Eldrazi Mimic, Matter Reshaper, Thought-Knot Seer, and Reality Smasher? Or is it, like Mike and Patrick agree… Eldrazi Temple and Eye of Ugin? What’s the best draw you can get with an Eldrazi Aggro deck? Turn two: Eldrazi Temple, Simian Spirit Guide, and Reality Smasher… Swing for 20! In case you’ve been living under a rock, the Modern format has been turned on its ear by Oath of the Gatewatch. There is a new Tier One strategy and it is largely defined by the powerful threats from the newest set (with some mana base help from the last time we encountered the Eldrazi). Mike like LSV’s take on Reality Smasher best… But it wasn’t even the most successful build! 4 Relic of Progenitus and 2 Scrabbling Claws main deck? Frank Lepore is prepared for Living End! 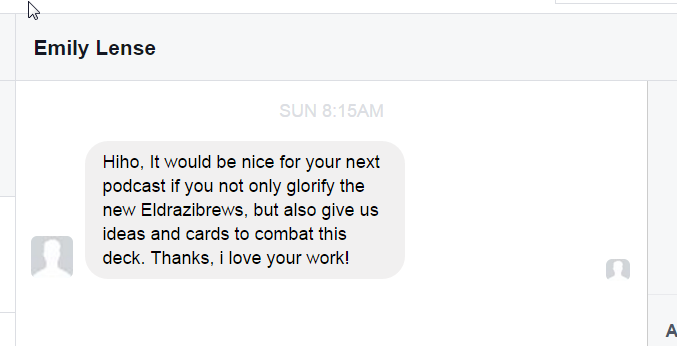 So how do you fight the Eldrazi in Modern? And in typical Tom Ross style, there was a little something extra going on in The Boss’s deck. And that something was Thopter Engineer! Thopter Engineer essentially takes the “Hordeling Outburst” slot in this deck. Hordeling Outburst makes three points of power and three points of toughness “3/3” for three mana… Thopter Engineer is not much worse; its two points of power and four points of toughness “2/4” are spread over only two bodies but the two cards are at least somewhat comparable. On balance, the 1/1 token on Thopter Engineer both can fly and has haste, which are advantages relative to Hordeling Outburst. It probably goes without saying that Thopter Engineer can be a superior card defensively, given the additional two points of toughness when leaving a body back. Thopter Engineer gives artifact creatures haste. Hangarback Walker — a card that Tom plays four of main deck — happens to be an artifact creature! Playing Thopter Engineer allows Tom to save a mana later in the game whenever he topdecks or plays a Hangarback Walker. Instead of spending four mana, say, for a 2/2 Hangarback Walker he can pay only two mana (1/1) and then tap it with one mana (three mana total) for the same 2/2 size. A dying Hangarback Walker can attack immediately with all of its tokens thanks to the Thopter Engineer’s haste; and Thopter Engineer into Pia and Kiran Nalaar three-into-four is also offensively effective. Interested in a visit to Magical Christmas Land? How about playing a Hangarback Walker, adding a counter at a discount (with haste), sacrificing it to Pia and Kiran Nalaar for two… And then attacking with all your Thopters? Like you do. Thopter Engineer and… Haven of the Spirit Dragon? Tom’s deck — perhaps unsurprisingly with eight main-deck Dragons + Draconic Roar — plays three copies of Haven of the Spirit Dragon. 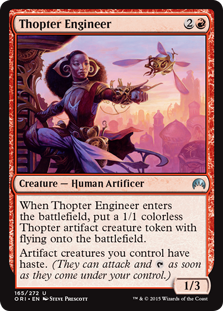 What does that have to do with Thopter Engineer. Just cutting one red mana off of the three mana cost makes it much more convenient to cast in even a two-color deck with nineteen sources of red mana (not counting Dragon-red). Imagine you open with Duress and follow up with Grasp of Darkness; that’s Swamp and then Swamp-Swamp. You wouldn’t even be able to cast Hordeling Outburst from that spot, but Thopter Engineer is cake! Check out Patrick’s new card game, Eternal!